Slice data from up to three survey questions to uncover valuable correlations. 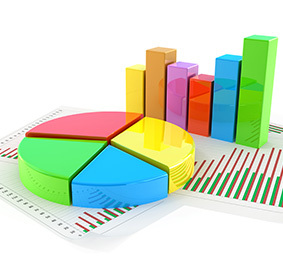 Counts and/or percentages can be applied to make presentations easier to understand. The Individual Report displays complete results for each survey participant. The value of this report is the ability to drill-down into individual respondents' answers. The Verbatim Report extracts inisghts that may not even be on your radar. This report allows you to set conditions to analyze similar segments of open-text resposnes. The Quick View Report offers a swift, simple representation of the number of times each answer for a particular question was chosen. The Conditional Reports allows you to set filters that draw from the total data set to discover actionable insights on sub-group relationships between questions. The robust Pivot table enables you to cross tabulate one question against every other quesiton in a survey. The Comparison Report enables you to conduct valuable Segmentation Analysis by showing side-by-side attributes of 2-5 questions in bar graph format. The Response Table allows you to view how each respondent answered specific survey questions. The Frequency Report allows you to view how many times each answer for each question was selected. The Statistical Report lets you compare valuable statistical measures of a specific question, with those of the complete data set.